Theresa's Crafty Creations: Triple B-day Balloons..
Yep, masculine cards are a little trickier - but you did a fabulous job! 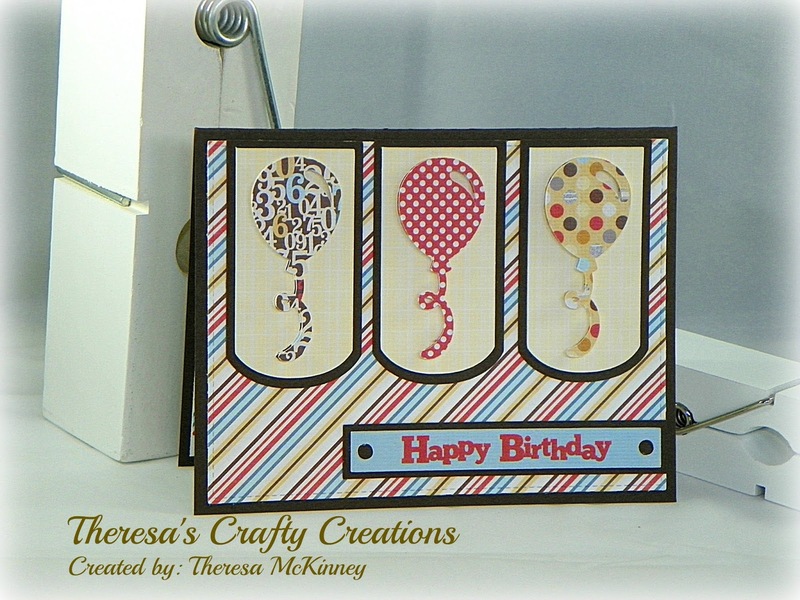 Your triptych balloon birthday card is wonderful! This is such a wonderful card Theresa!!! I so love the pattern papers you used. The balloon with the number paper is really great!! Another awesome card!!!! Fantastic card! I love all the fun prints you used~they coordinate so well~ Fun design my friend! Wow, Theresa! You are a card making machine!! Love the papers and design!!! The masculine cards are so tough (for me!). My hubby gets a lot of pink cards haha and luckily he doesnt mind! You did very well with your manly card - love the balloon theme! Another awesome guy card, I love it! Have a great week. I am finally starting to set up my craft room. Boy, it sure takes a while. What a fabulous Birthday card!! I love all the papers you used!! This is a great card!! Have a great day. What fun! I love all the patterns. What a great Quick card and so much fun! Love it! Wonderful birthday card! I agree, I can make feminine cards any day of the week. It takes focus to make guy cards LOL! You nailed it with this one! Very pretty card! The balloons look so awesome! And I just love how you are creating so many masculine cards, I need to challenge myself to do the same! This is a fun card and perfect for a guy. I love the printed balloons and cute layout! Another great LO! I think you may see this again on my blog, but I am gonna turn it into a Christmas card. Really cute papers too. So pretty! Love that design! !